This blog summarizes our recent published article that describes a teaching healing approach that can be used by many clients to mobilize their health. The process is illustrated by a case report student who had suffered from psoriasis for more than five years totally cleared his skin in six weeks and has continued to this benefit (Klein & Peper, 2013). At the recent one year follow-up his skin is still clear. Low energy, being tired and depressed, having pain, insomnia, itching skin, psoriasis, nervously pulling out hair, hypertension and other are symptoms that affects our lives. In many cases there is no identifiable biological cause. Currently, 74% of patients who visit their health care providers have undiagnosed medical conditions. Most of the symptoms are a culmination of stress, anxiety, and depression. In many cases, health care professionals treat these patients ineffectively with medications instead of offering stress management options. For example, if patients with insomnia visits their physicians, they are most likely prescribed a sleep inducing medication (hypnotics). Patients who take sleeping medication nightly have a fourfold increase in mortality (Kripke et al., 2012). If on the other hand if the healthcare professional takes time to talk to the patient and explores the factors that contribute to the insomnia and teach sleep hygiene methods, 50s% fewer prescriptions are written. Obviously, you may not be able to sleep if you are worried about money, job security, struggles with your partner or problems with your children; however, medication do not solve these problems. Learning problem solving and stress management techniques often does! Daily monitoring of subjective and objective experiences to facilitates awareness and identify cues that trigger or aggravate the symptoms. Sharing subjective experiences in small groups which reduces social isolation, normalizes experiences, and encourages hope. Usually, a few students will report rapid benefits such as aborting a headache, falling asleep rapidly, or reducing menstrual cramps, which helps motivate other students to continue their practices. Writing an integrative summary paper, which provides a structure to see how emotions, daily practices and change in symptoms are related. The first step is usually Identifying the trigger that initiates the illness producing patterns. Once identified, the next step is to interrupt the pattern and do something different. This can include transforming internal dialogue, practicing relaxation or modifying body posture. The mental/emotional and physical practices interrupts and diverts the cascading steps that develop the symptoms (Peper et al., 2003). Interrupting and transforming the chained behavior is illustrated in our article “There Is Hope: Autogenic Biofeedback Training for the Treatment of Psoriasis” published in the recent issue of Biofeedback. We report on the process by which a 23-year-student totally cleared his skin after having had psoriasis for the last five years. Psoriasis causes red, flaky skin and is currently the most common autoimmune disease affecting approximately 2% of the US population. Many people afflicted with this disease use steroids, topical creams, special shampoos, and prescription medication. Unfortunately, the disease can only be suppressed, not cured. Thus many people with psoriasis feel damaged and have a difficult time socially. Stress is often one of the triggers that makes psoriasis worse. In this case study, the 23-year-old student learned how to train his mind/body to transform his feelings of stress, anxiety, self-doubt, and urge to scratch his skin into a positive self-healing process. Initially, the student was trained in stress management and biofeedback techniques that included relaxation, stress reduction, and desensitization. He learned how to increase his confidence by changing his body posture while sitting and standing. He also took time to stop and refocus his energy when he felt the need to fall back into old habits. What did he really do? To become aware of his automatic negative behavior was very challenging. He had to stop focusing on the task in front of him and to put all of his energy into regaining his composure. This is very difficult because people are normally captured by whatever they are doing at that moment. As he stated: “Breaking this chain behavior was by far the hardest things I’ve ever done. It didn’t matter what situation I found myself in, my practice took precedence. The level of self- control I had to maintain was far beyond my norm. I remember taking an exam. I was struggling to recall the answer to the last essay question. All I wanted to do was finish the exam and go home. I knew that I knew it, it was coming to me, I began to write… Yet in that same moment I felt my right elbow start to tingle (the location of one of the psoriasis plagues) and my left hand started to drift towards it. Immediately I had to switch my focus. Despite my desire to finish I dropped my pen. I paused to breathe and focused upon my positive thoughts. Moments like this happened daily, my normal functions were routinely interrupted by urges to scratch. Sometimes I would spend significantly more time doing the practices than the task at hand. After three weeks, his skin had cleared and has continued to stay this way for the last year as shown in Figure 1. Figure 1. 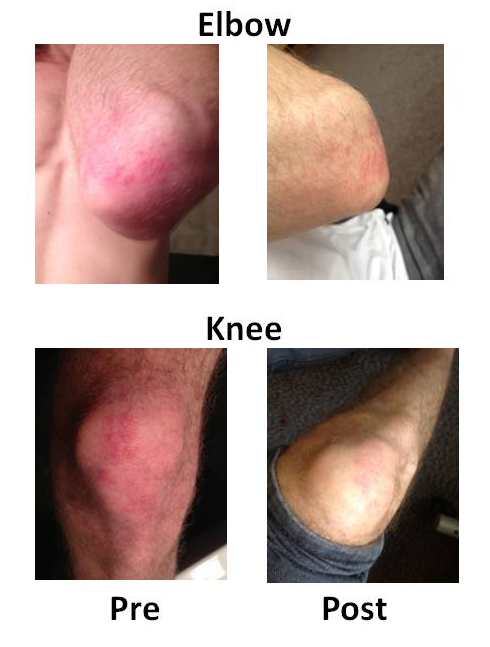 Pre and post photos of the elbow and knee showing the improvement of the skin. There are many diseases and ailments that require the use of medication for appropriate treatment, but when stress is a factor in any diagnosis, or when a diagnosis cannot be found, it is important for stress management to be offered as a viable option for patients to consider. As shown by the student with psoriasis, learning stress management skills and then actually practicing them during the day can play a major factor in improving the health of an individual. The same process is applicable for numerous symptoms. There is hope=-Just do it. Wonderful experience reading your article. Very elegant technique. I apperciate the student’s honesty about how much self-discipline it took to stay with the process.